Fulton, Md. 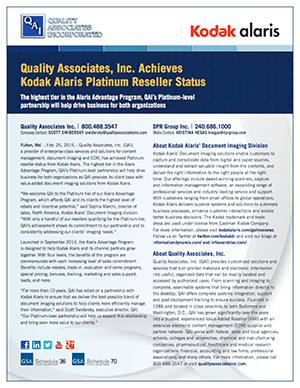 – Feb. 25, 2015 – Quality Associates, Inc. (QAI), a provider of enterprise-class services and solutions for content management, document imaging and ECM, has achieved Platinum reseller status from Kodak Alaris. The highest tier in the Alaris Advantage Program, QAI’s Platinum-level partnership will help drive business for both organizations as QAI provides its client base with value-added document imaging solutions from Kodak Alaris. Launched in September 2014, the Alaris Advantage Program is designed to help Kodak Alaris and its channel partners grow together. With four levels, the benefits of the program are commensurate with each increasing level of sales commitment. Benefits include rebates, trade-in, evaluation and demo programs, special pricing, bonuses, training, marketing and sales support, leads, and more. Kodak Alaris’ Document Imaging solutions enable customers to capture and consolidate data from digital and paper sources, understand and extract valuable insight from the contents, and deliver the right information to the right people at the right time. Our offerings include award-winning scanners, capture and information management software, an expanding range of professional services and industry-leading service and support. With customers ranging from small offices to global operations, Kodak Alaris delivers superior systems and solutions to automate business processes, enhance customer interactions and enable better business decisions. The Kodak trademark and trade dress are used under license from Eastman Kodak Company. For more information, please visit kodakalaris.com/go/mvsnews. Follow us on Twitter at twitter.com/kodakdi and visit our blogs at informationdynamix.com/ and infooverdrive.com/. Quality Associates, Inc. (QAI) provides customized solutions and services that turn printed materials and electronic information into useful, organized data that can be readily located and accessed by authorized users. From scanning and imaging to complete, searchable systems that bring information directly to the desktop, QAI offers complete systems integration, support and post-deployment training to ensure success. Founded in 1986 and located in close proximity to both Baltimore and Washington, D.C., QAI has grown significantly over the years into a trusted, experienced Value-Added Reseller (VAR) with an extensive electronic content management (ECM) supplier and partner network. QAI works with federal, state and local agencies; schools, colleges and universities; chemical and manufacturing companies; pharmaceutical, healthcare and medical research organizations; financial, accounting and law firms; professional associations; and many others. For more information, please call 800.488-3547.